2 Year Anniversary – Steel Update! One year ago we started seeing iron equipment, and now we have steel! You can create steel bars using a refined process at the bloomery. Investing some gold into a bloomery will upgrade it to have a chance of producing steel instead of iron. 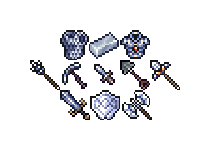 Several steel items are now available to craft and some more will be discovered in later patches. Also a new shovel is available which can dig deeper into the underworld and has a higher durability. Read on for more changes and also a sneak peek at some exciting future additions. Steel bars and equipment are more rare to find in treasure chests. Steel, potions, and silver have a lower duplication limit at altars. Gold can now duplicate(increase) up to 2 pieces at altars unless you have 10 or more, then it will steal half. The cooldown of resources at South Sands Desert has been increased to match Snowtop Peaks. Repair spam in chat has been removed. It will only tell you when equipment is fully repaired. Fixed a bug where tribe members couldn’t be kicked in certain tribes. Chaos NPCs now level a little faster and cast shell as soon as they spawn. Fixed a bug that was preventing them from picking up certain equips. They also target higher levels more often. For those that missed the dev notes in the forums: You can no longer build or repair on the edge of a map. A /pvp command was added so you can avoid accidentally damaging other players and structures. Infamy penalties were reduced for higher level players. The /ignore command now works permanently across logins, and /ignorelist keeps track of who you are currently ignoring. New type of underworld altar for combining equipment. This altar will let you merge 2 pieces of equipment so they spawn a baby equip. They don’t need to be the same type and the result will mix and potentially improve on the current stats, gems, and runes! This way with enough equipment and attempts you can finally max out your runes. Gem stat bonuses past level 100. Any skill you would have over 100 thanks to enhanced equipment will give your character certain bonuses. Different classes of skills will give different bonuses. For instance tilling above 100 wont improve on your ability to till, but may give more max HP based on how far above 100 you are. Smithing may add to your damage, etc. So the more gems you invest the more powerful you can become. This will buff the value of gems and less popular skills. I mentioned it in the dev notes already but a new town is coming soon called Wellington. It will be a safe town for casual players and newbie village graduates so they don’t have to stress about raids and pvp if they just want to enjoy the peaceful elements of the game. There will be some special rules and limitations regarding building and progression that will deter non-casual players and griefers. There is also a high level town coming that will be catered to veteran players. New silk and leather processes. This will create some higher level light and medium armor options. Also look forward to new weapons for the unarmed skill, and better balancing for two handed weapons and gem bonuses. I also want to add some new options for decorating the outside and inside of houses. Anyways, enjoy the patch and thanks for your support and testing the game!